Gorgeous Gulf View from Bedroom! 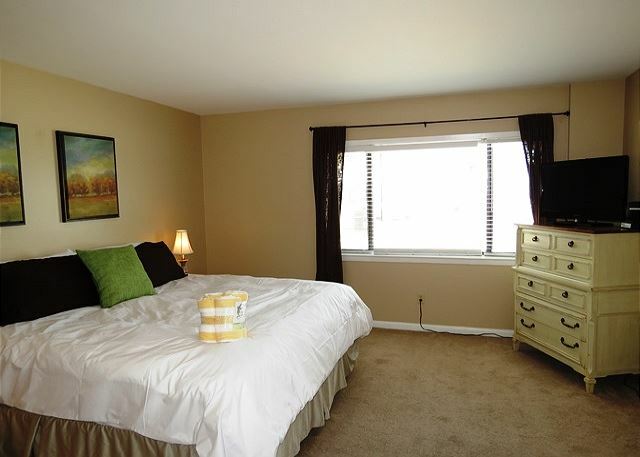 Spacious Bedroom with King size bed and a large flat screen. 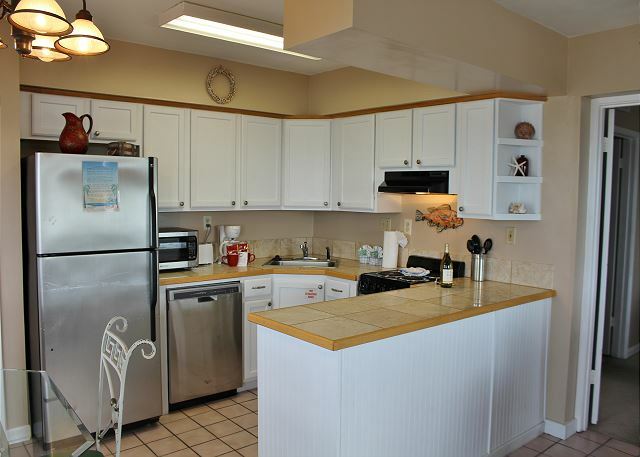 This end unit has its own private deck to enjoy the sunrises and sunsets. Enjoy your coffee while watching and listening to the waves lap up on the shore. Destin, Florida is known as "the worlds luckiest fishing village", but we do not stop there! The whitest beaches of Florida and the Emerald Green waters are unmatched. Shop in an outlet mall, an upscale outdoor mall, or one of many boutique stores. When you are through shopping, there are endless places to enjoy the local fare or just get a quick bite. Don't forget about our water park, amusement parks, and our dozens of golf courses. It was great with perfect weather. 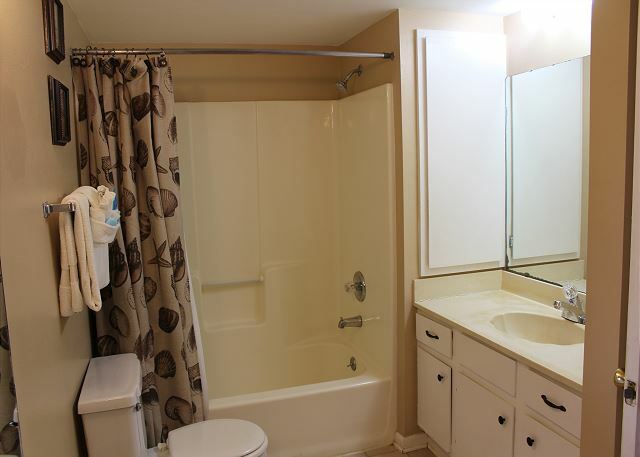 The unit that we were in was very comfortable and we loved having the end unit with its own deck. It was really nice sitting out there and enjoying the views, the sounds and topping it off with a couple of glasses of wine !!!! The mattress on the bed was very comfortable and much better than other places that I have stayed in. Thank you for your review of Capri by the Gulf #108. We are happy to know that you all had such a wonderful stay and we look forward to welcoming you all back again soon as our guests here at Capri by the Gulf in Destin! Thank you for sharing your review for Capri by the Gulf #108. 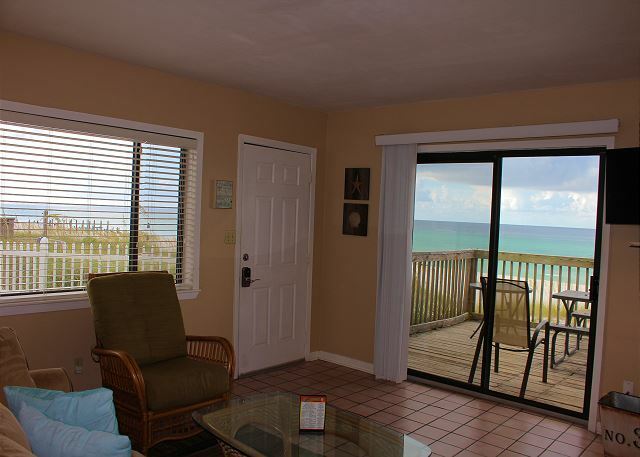 We are delighted to know that you all so enjoy this great beach front condo and that you all have it figured out as to how to really take advantage of being at the Beach! We also thank you for your suggestion and we will look into this. We look forward to having you all back again soon as our guests here in beautiful Destin, FL! We really enjoyed having our own private deck to relax on. We used it a lot in the morning hours and again in the evening hours to unwind after a beautiful day at the beach. This was our first time in this condo and while it was clean it needs to be updated. 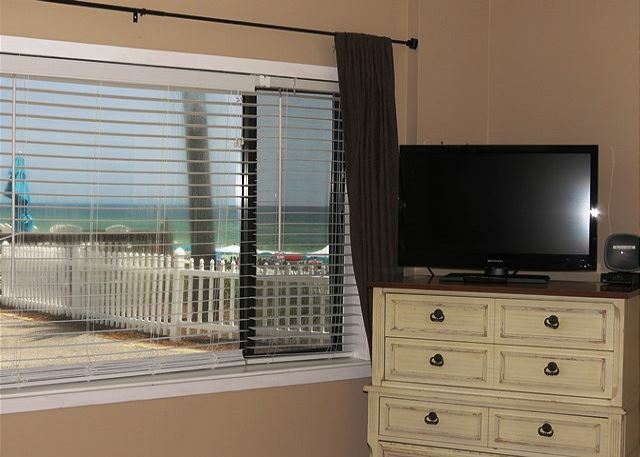 We enjoyed being able to look out the patio door and the large kitchen window to see the beach whenever we wanted and that made up for the furnishings. We would stay here again because of the deck and the view of the beach. The office staff were easy to work with and always pleasant. Thank you for sharing your review for Capri 108. 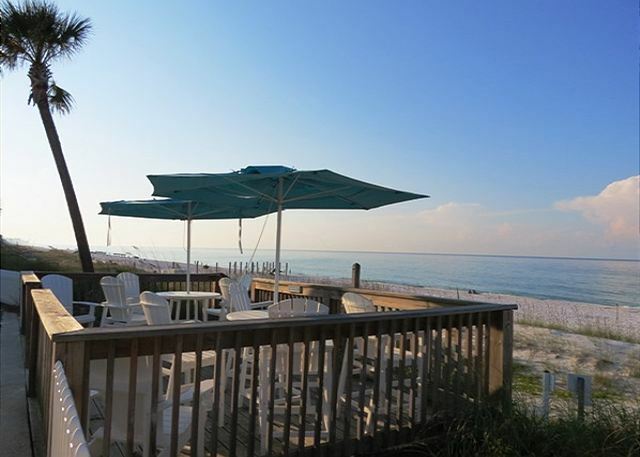 We are pleased to know that you all enjoyed your stay in this beach front condo and that you so appreciated the Gulf Views from inside the home and from the private beach deck! We thank you for your kind words for our team, we appreciate that very much! We also thank you for your suggestions and we do share our guests feedback with homeowners for them to consider when making updates to their homes. We hope to be welcoming you all back again real soon for another wonderful vacation stay here at the beach! Vacation rental was clean and had a fabulous view of the gulf. Will definitely be staying in this rental again when visiting Destin. Highly recommend this vacation rental. Thank you for sharing your review for Capri by the Gulf #108. We are so happy that you had a fabulous vacation stay in this beach front condo and that you so enjoyed the view of the Gulf of Mexico! 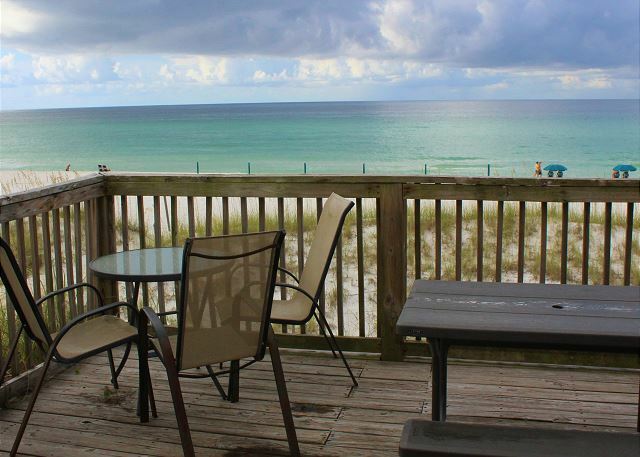 We hope to welcome you back very soon for another wonderful stay with us in Destin, FL! This was our second time staying at the Capri and we booked again for next year. You can't ask for a better location and view of the Gulf. The only thing I would change would be to put some padding on the dining chairs because they get a little uncomfortable after sitting on them for a while. We had another nice vacation and looking forward to next year. Thank you for sharing your review for Capri by the Gulf #108. We are so pleased to hear that you all so enjoyed your stay with us and we thank you for reserving for next year! We thank you for your suggestion as well, and we do share our guests suggestions with homeowners for them to consider when making updates. We look forward to having you all back again as our guests at the Beach in Destin, FL! Very quiet and nice. Good distance to Publix, Whole Foods, etc. Kitchen convenient and well-stocked. Staff was pleasant and helpful in recommending restaurants. Beach well-managed. Free umbrellas and beach chairs a plus! My husband says he would prefer a key for the lock, rather than a combination lock. The dumpster was a little hard to find, in front of the gate. We thought it might have been in the courtyard. Thank you for sharing your review for Capri by the Gulf #108. 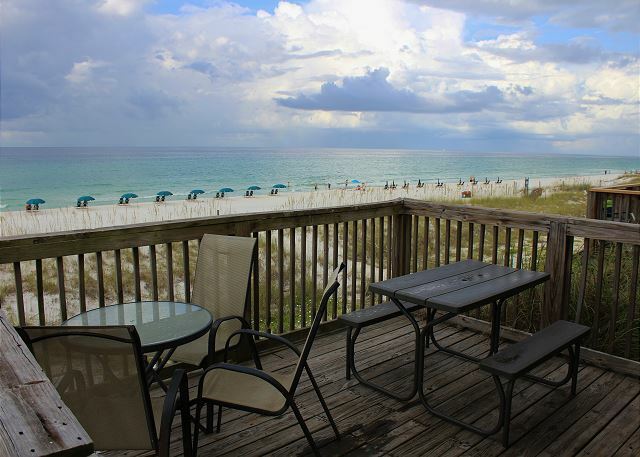 We are so pleased to know that you all had a relaxing stay with us here in Destin, FL! We're happy that we were able to offer helpful information and also glad to know that you enjoyed the complimentary beach service! We hope to welcome you all back again soon as our guests at Capri by the Gulf! Only place to stay in Destin!! Thank you for sharing your review for Capri by the Gulf #108. We are so pleased to hear that you all had a pleasant stay with us and we would be delighted to welcome you all back soon as our guests in Destin! Our Favorite Place on the Planet! peace and quite, and the great staff! Thank you for sharing your review and kind words. We have enjoyed having you all as our guests at Capri by the Gulf and we look forward to having you all come back soon to your favorite place on the planet, right here in Destin, FL! A beautiful week with loved ones that went way to fast. Thank you for sharing your review. We are so pleased to know that you and your loved ones had such a wonderful stay with us at Capri by the Gulf! We would love to welcome you all back soon for another beautiful week of sunshine in Destin! Capri 108 is the best! We had no worries with renting Capri 108. The kitchen has all the utensils you need. Bring extra trash bags and toilet paper just in case. I plan on coming back! Great experience! Thank you for your review. We are so pleased to hear that you all enjoyed yourselves so much at Capri by the Gulf #108 and we hope to have you back real soon as our guests in Destin, FL! Thank you very much to allow us to rent this unit. 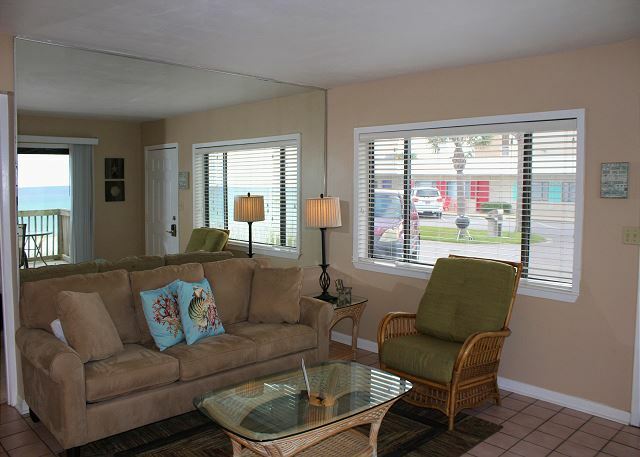 Fantastic location, a mere seconds from the beach. Comfortable, relaxing, clean. We would recommend this unit. Thank you for sharing your review and Thank You for being our guests! We appreciate having you all stay with us at Capri by the Gulf #108 and we are so happy to know that you all had a Fantastic Stay at the Beach! We would love to welcome you all back soon as our guests in beautiful Destin, FL! This is our perfect vacation home!!!! Thank you for sharing your review. We appreciate having you all as our guests over the years at Capri by the Gulf and we are so pleased to hear that you all enjoy so many things about the Capri! 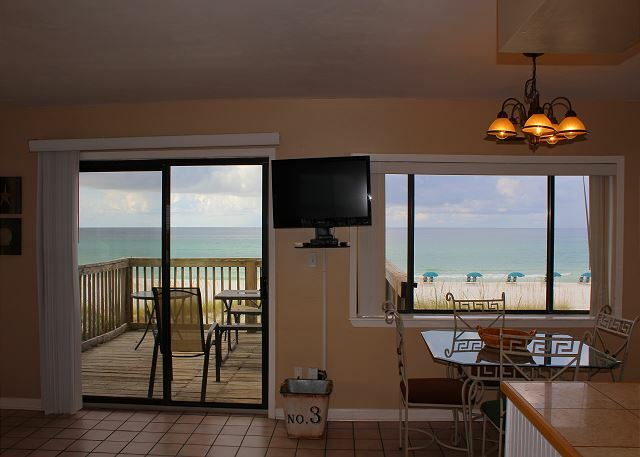 We would love to have you all back soon as our guests at your 'perfect vacation home' in Destin! The Capri is perfect for a getaway and the view can not be compared to any other place I have been. The rooms are spacious and clean. The beach service is very nice to have and also private. Being a gated community is also a big plus. I already booked for next year. Thank you for being our guests and for sharing your review! We are pleased to hear that you experienced the 'best ocean vacation' you've ever had during your stay with us at Capri by the Gulf #108! We look forward to having you back soon to our beach community! 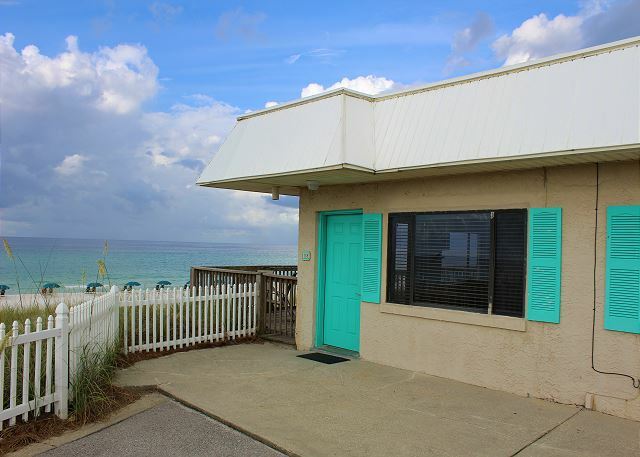 The best kept secret on the Emerald Coast! Ww have been coming to Capri by the Gulf for many years. We come for the fantastic view and the quite and peaceful vacation experience. You will not find a more helpful and friendly team than the staff at Capri by the Gulf! My family and I stayed here for the first time and I have ZERO complaints! The staff was amazing, we loved the complimentary wine waiting for us when we arrived! The condo was perfect and the view was a dream come true! Already planning on booking our next stay within the week! This will be our home away from home, or as our two year old calls it "beach house" (: thank you for the incredible experience! We can't wait to come back, and this time for twice as long! Thank you for sharing your kind review. We are so delighted that you all enjoyed your stay and we would love to have you back as our guests at the beach to your 'beach house'! We always enjoy our stay here. Everything was great as always. Thank you for sharing your review. We appreciate having you as our guests over the years and we hope to have you back as our guests again soon! Very nice and quite place to stay. We have stayed in 108 for 8 years we have never wanted to stay anywhere else. Great staff. All around great stay. Thank you for sharing your review. We are so pleased that you all enjoyed your stay at the beach and we hope to have you stay with us again! We appreciate having you as our guests over the years! I took a mini vacation and so enjoyed my stay at Capri by the Gulf #108. I checked in on Friday and out on Monday. I so enjoyed my private deck. 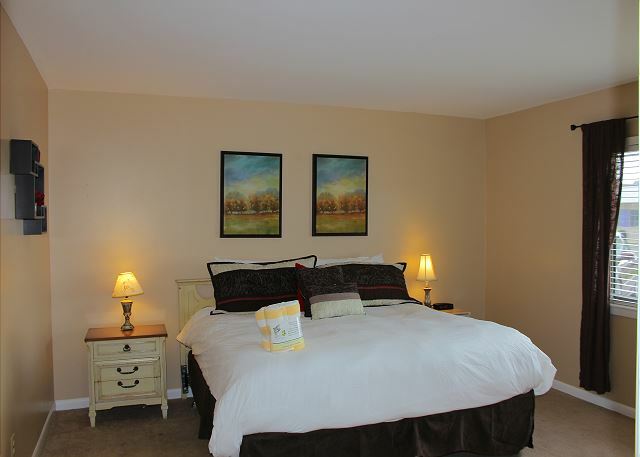 The condo was spotlessly clean, had all the necessary conveniences, and was spacious, cheerful, and comfy. With security parking, I felt completely safe. A few days of beach therapy was exactly what I needed. The staff was so warm and friendly. My only "complaint" is with check in being late in the afternoon (between 4-5pm) and check out in the morning (10am) I felt cheated out of two actual days. Nevertheless, my time spent was glorious. I have already recommended this spot to friends and will definitely be back! Thank you for sharing your review. We're so glad you all enjoyed your stay with us and we hope to have you stay with us again soon! We have to have set check out-check in times so we have time to get each home perfect for each guest to be able to completely enjoy their stay with us. A wonderful place, with a world class view of a beautiful beach. I had stayed at this place when it was a motel years ago - over 55 years ago. It had been replaced with condos and this was a return trip to a place where I spent many happy vacations as a a child. 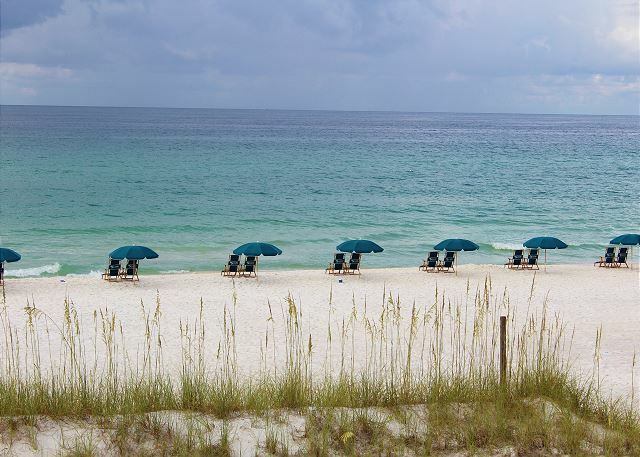 The beach at Destin is beyond beautiful - the softest, white sand and the clear Gulf waters are unsurpassed in beauty. Destin itself it not the sleepy little fishing village it once was, but the beach is gorgeous. Capri has a huge beach front for its guests, with easy access to the water. There are many fancier places to stay, but none with a better beach, better view of the beach, easier access to it, or better value for your travel dollars than the Capri. I was away from Destin for too many years - we'll be back, and will return more often for frequent visits. Thank you for your review. How special that you have such a wonderful history with the Capri! Thank you for sharing the added details that future guests can consider when selecting their Destin vacation home. We look forward to having you stay with us again and maybe you would enjoy being one of our winter monthly guests. We would love to have you! Bed is awesome, the living room furniture is not comfortable and the deck table needs to be replaced. Thank you for sharing your review. We're so glad you enjoyed your stay and we appreciate your suggestions. We do share our guests feed back with the home owner's as they too enjoy hearing from our guests. We hope to have you back as our guests soon! We thoroughly enjoyed our stay here! We got married on this beach last year and this year, we got to overlook the exact area where we got married. It was wonderful! 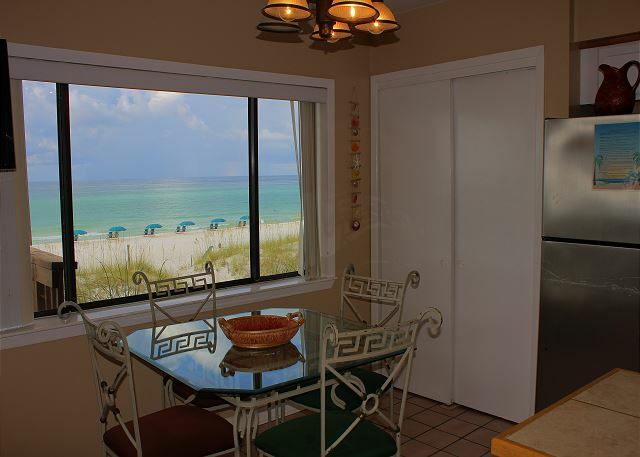 We always use Harmony Beach Vacations for our stays in Destin-the staff is wonderful and their prices can't be beat! This room was no exception! The complimentary wine and towels were a GREAT touch!! I love Capri and love the staff. This was not my vacation. I rented the unit for my granddaughter's honeymoon. The staff at Capri went above and beyond the call of duty to help make their very late arrival there memorable. I received only positive feedback from the honeymooners. I would not have expected less being a repeat guest at Capri myself and never disappointed in my stay. Thank you so much for the review! We are very happy the honeymooners enjoyed the Capri! We hope to have you and your family stay with us again soon at the Capri! like your own apartment on the beach! We love the Capri! Its our second year there and we are planning on booking it again! You cant get any closer to the beach! The private beach and the location are wonderful! Well originally we had a full week booked at the Henderson Park Inn Bed and breakfast. But arrived a day earlier and could not find anything with the same amazing view last minute. These kind folks were amazing enough to give us this unit for an amazing price even on 4th of July weekend. I would Def stay there again.